Over the weekend Ryan and I took a trip up to The Reappliance Store by the airport. My brother and his wife bought a new stove for their house there and we thought meh we have nothing else going on.. lets go take a peak at what they have. PLUS they had a don't pay the taxes sale! So we were like hmmm why not... can't hurt to look. We honestly had NO intentions of buying anything!!! WELL... I would just like to say that I LOVE THE REAPPLIANCE STORE!!! Its basically a scratch and dent warehouse but it does have undented/scratched appliances as well. Anyway, we walked it and started looking at gas stoves. I'm embarrassed to say that our current gas stove requires pliers to turn it on and off.... probably NOT the safest thing to have when you have a baby on the way!!! You can see our current stove on the right of the very old picture below! It worked and was nothing special... we even had it repaired about a year ago because we didn't want to have to pay $1000 for a new gas stove. Gas stoves are pricey!!!! Then about 4 months ago while cooking I couldn't turn it off without pliers.... more frustration. Which means we haven't been using it, we use our little toaster oven instead because for 2 people it works great!! But Christmas is coming up and I go baking crazy and wanted an inexpensive stove that I could bake MANY cookies in! Oh did I mention our current stove is missing a rack so you can only cook one thing at a time.... no idea where the other rack went... I believe we had it when we moved into the house... its one of those mysteries, up there with my missing socks that NEVER come out of the dryer. Anyway, so we walked into The Reappliance Store and instantly were in awe at the number of appliances and the prices! They were RIDICULOUSLY CHEAP!! Some of them had minor scratches, others appeared to be perfect, some are refurbished. We got a little side tracked at first and started looking at a new dryer. To paint the picture of our current dryer... its probably 20+ years old, the dial was lost before we bought the house which means once again you had to use pliers to turn it on. AND the worst part is that you can only turn it on for about 20 minutes because it overheats... yes that is correct... SAFETY HAZARD!!!! Since we plan on cloth diapering it up when the blueberry is born we decided to check out the deals on dryers. 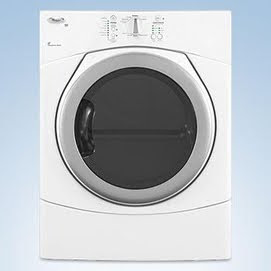 Low and behold there was the EXACT dryer that matches our current washing machine except in silver rather than white. BIG DEAL!!!! AND to top it off it was only $420!!!!!! Just to show how amazing of a deal this is... the exact same dryer at sears but in white is being sold for $850 plus tax!!! Can we scream a little bit and get excited!!!! Ryan and I stopped and starred at the dryer in awe... of course our washer was right next to it for half the price we paid for it... ARGH... so we did have to walk away for a few minutes to contain ourselves and not completely freak out!! BUT we fell in love with the dryer and agreed we would purchase it. Then we got back to the original matter of a new stove. The majority of the stuff in the store is stainless steel which would be great if all of our other appliances were stainless steel... but since we just reno'd our kitchen to be white and all of our other appliances are white we really wanted to stick with a white stove. There was only ONE white gas stove and it was PERFECT! I didn't want anything fancy... I wanted something simple and easy to use that didn't have too many digital buttons etc that can easily break and cost a fortune to fix! Plus I have an issue with having a gas stove that has a lot of electrical options... don't ask me why but I don't think gas and electricity really go together. Enough of my blabbering... we came across this beauty!! It was everything that I wanted! Easy to use, easy to clean and TWO RACKS!! Plus to top it off it was only $420 as well!!!!! (Ok well they both weren't exactly $420.... I just know we spend $840 total on both so I'm splitting it up evenly because it was pretty darn close to that). 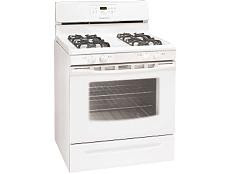 Now to compare that price to what this exact stove is selling for at The Brick on CLEARANCE... drum roll. It is being sold on Clearance at the Brick for $598.97 plus tax BUT there is a big disclaimer stating that clearance products have various degrees of damage. Our $420 stove is brand new and there is only a TINY little scratch on one side that you can barely even notice!!! Normally this stove sells for $849! Once again WOOOHOOOO!!! Ryan and I couldn't have been happier!!! Now we just have to go pick up our purchases... Ryan opted our of the $75 delivery as he can just borrow a friends truck to pick them up. Plus then he can take our old stove and dryer and a metal desk we have in the backyard to the metal scrappers to get some extra cash for them!!! VERY exciting!!! I can't wait for the new appliances to arrive so I can bake bake bake!!! Ryan is pretty excited for me to bake as well as I haven't done it since Christmas because the old oven was a pain to use!! !